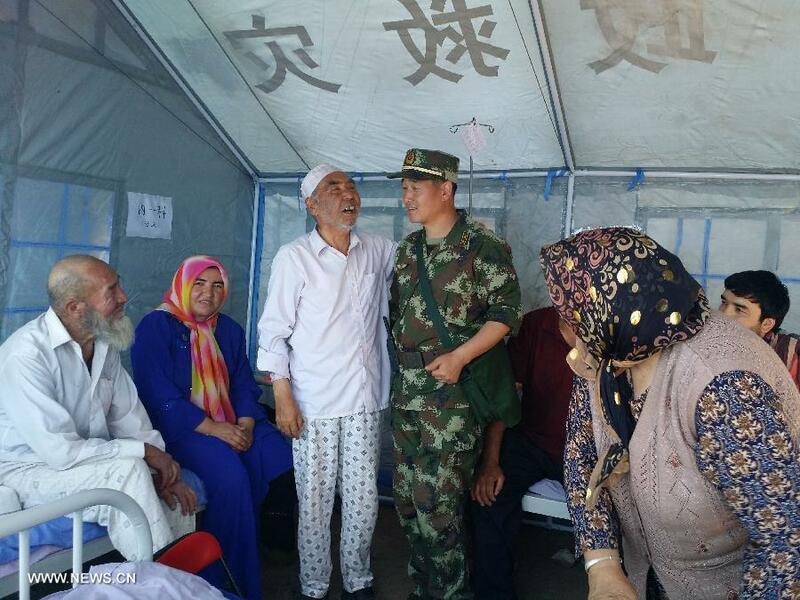 HOTAN, Xinjiang, July 4 (Xinhua) -- Rescue and relief work continues following the 6.5-magnitude earthquake in Xinjiang Uygur Autonomous Region, northwest China, on Friday morning. So far, there are three confirmed deaths and 71 injured. The Xinjiang government has earmarked a 20 million yuan (3.2 million U.S. dollars) disaster relief fund. Those affected by the quake have received 1,500 tents, 2,000 quilts and 2,000 coats. The quake shook Pishan County, Hotan Prefecture, at 9:07 a.m. The epicenter was recorded at 37.6 degrees north and 78.2 degrees east at a depth of 10 km, according to the China Earthquake Networks Center (CENC). The area has also been hit by after shocks, according to the CENC. The earthquake damaged 12,000 houses, according to the publicity department of the Communist Party of China Xinjiang Committee. In excess of 66,000 people have been evacuated. Twenty tents have been erected at the People's Hospital of Pishan County to accommodate the injured. As of Friday night, 27 people had been treated in the tents. "Most had soft tissue injuries," said Wen Bin, president of the hospital. "We are also helping people cope with the hot weather with cooling products and started epidemic prevention work." Many of those displaced have been relocated to No.1 Middle School in Pishan. Rescuers and soldiers have set up shelters and distributed food and water. Rescuers and government officials have visited every tent to speak to the injured. Harenisa Abdurahman, an evacuee, told Xinhua that at the time of the quake she was feeding her sheep and her husband was in the house sleeping. "He was buried by debris but I could not pull him out by myself. Thanks to the village officials, if they had not arrived I dread to think what might have happened," she said. A shop owner, Abudurehim, and his wife laid out a blanket on the roadside and provided the quake-affected people with free bottled water and instant noodles. A civil society group, "Dongaimengxiang", sent two batches of relief goods and medicine to Pishan and provided free water, pancakes and watermelons. The epicenter was between the Pishan County seat and the Pixna Township. In Pixna Township, five temporary settlements have been established to accommodate those who lost their homes in the quake. One person died and 30 others were injured in the town, said Lu Kailun, secretary of the Pixna township committee of the Communist Party of China. The victim was an elderly person without any family. "She was sitting under a shed when the earthquake hit," Abliz Mahsut. "We tried our best to save her life, but failed." Though about 12,000 houses were damaged in the quake, the newly-built quake-resistant houses, the result of a 2004 project, are safe and sound.